Serving steak to guests can be a pricey choice for entertaining. 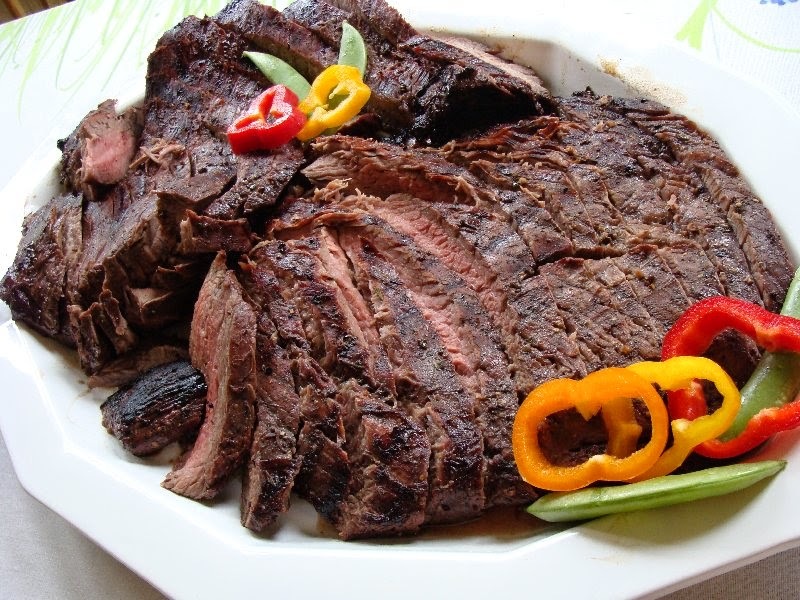 However, flank steak is an inexpensive option and is perfect for the barbeque. When marinated (give it at least 5 hours), it is flavourful and tender and I'll guarantee your guests will love it. Rosemary and grainy mustard add a lovely flavour to this marinade. Mix all marinade ingredients, blending well. Place Flank Steak in a large zippered plastic bag and pour marinade over it. Remove as much air as possible and zip shut. Marinate for 5-7 hours in the refrigerator and then another hour on the counter (it will grill better if it is at room temperature.) Turn the bag occasionally to distribute the marinade. Grill at a fairly high temperature, turning several times and brushing often with the marinade. Use a meat thermometer to gauge desired doneness, - we like ours medium rare. Let rest 5 minutes and then slice diagonally across the grain. If there are leftovers, they made a terrific steak sandwich, hot or cold. Looks like a great recipe. I used to serve flank steak years ago as a young married woman for entertaining too. My recipe wasn't for grilling though and it was different than yours. I'll have to see if I can find it and send it to you then we'll each have 2 inexpensive recipes for entertaining! LOL! I'm always open to new recipes!! Sounds great! I just discovered this cut of meat, because of another recipe that I was making for "Mongolian Beef". I definitely want to try your recipe. I really think the key is to use a meat thermometer. We cook ours to 165 degrees. HOLY MOLY...this looks awesome .Can't wait to give it a try. Ooo - that marinade sounds delicious and your picture makes my mouth water! I will definitely try this recipe.